Set on the stunning North coast and overlooking Crantock beach and the Atlantic Ocean, Crantock Bay really is in a ‘get away from it all’ location. The holistic spa is a recent addition and joins both the apartments and C-Bay Café - which enjoy uninterrupted views out to sea. 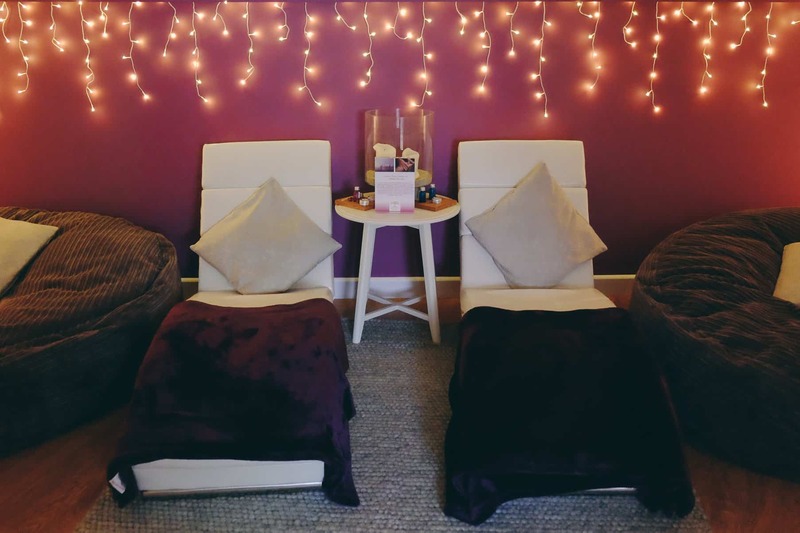 We were invited to sample the spa’s Twilight Relax and Dine package. Which, as the name suggests, takes place in the evening and includes either a hot oil full body aromatherapy massage or radiance facial, use of the pool and spa bath and dinner in C-Bay. Arriving at 4pm, we were welcomed by the spa team and handed towels and robes for use in the pool and spa areas. Our treatments were booked in for 6pm, so we had plenty of time for a swim. Although it was getting dark, we could still take in the amazing view from the pool through floor to ceiling windows as the light faded. We headed up to the spa ten minutes before our treatment time and were shown into the relaxation room. Settling into the very comfy large bean bags, we had a few minutes to try a fruit tea. I opted for the aromatherapy massage, whilst Sue chose the radiance facial. Both treatments were amazing and so relaxing - I think I may have even nodded off for a moment or two! The Made for Life Organics range is used in the spa. With a great ethos, they’re full of natural botanicals and packed with active ingredients from the wild world. They also smelt fabulous! With dinner booked in C-Bay at 7.30pm, we had time to head back downstairs to the changing area, shower and change. 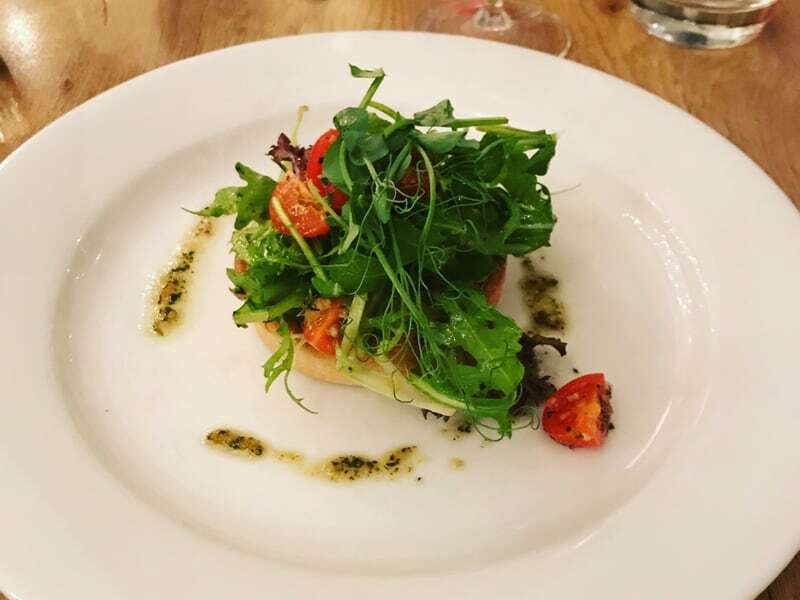 The menu offered an excellent selection of dishes to choose from, including several vegetarian starters and main courses. I decided to go for the brie, mushroom and caramelised tart to start, followed by a sirloin steak served with a roasted shallot and Diane sauce. 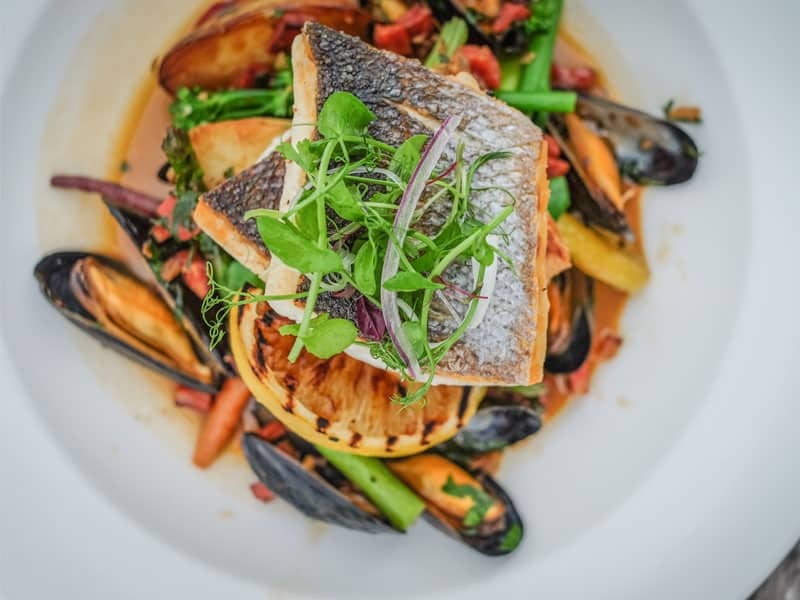 Sue chose the Cornish crab cakes and pan fried seabass with a local mussel broth and steamed greens. The food was delicious and went very well with our respective wine choices. Sadly, neither of us had room for dessert, even though there were some very tempting choices. So, feeling very chilled, full of good food, we headed home for a great night’s sleep. 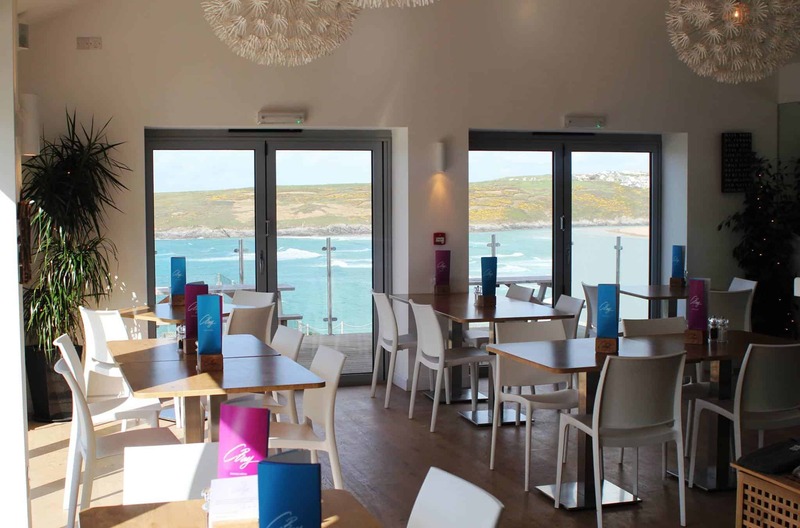 I can thoroughly recommend a visit to Crantock Bay Spa and the C-Bay Café. The Twilight Relax and Dine package costs £80, or £75 without use of the pool and is available between 4-9pm. A fantastic way to spend a winter’s evening - just be sure to get there before the sun goes down to appreciate the setting and view.